Many of you have probably been hearing the term "BB creams" more and more lately. BB cream stands for "Beauty Balm" and more and more brands are making them. They are a hybrid of a tinted moisturizer/primer product which also tackles: oily skin, acne, evening skin tone and sun protection all in one. 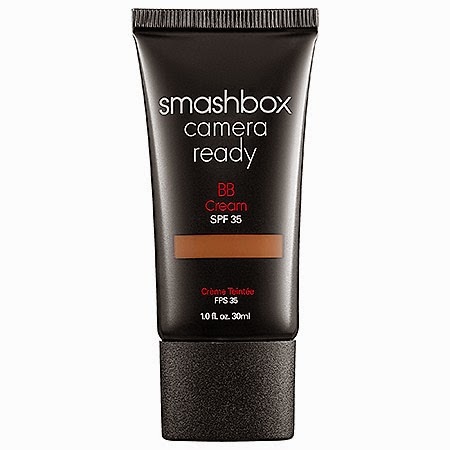 I've found that one of the major standouts in this category is Smashbox Camera Ready BB Cream SPF 35 The first reason is color range - right now most brands only have roughly 2 shades of their BB creams - very light and medium tones. However, Smashbox now has 8 shades, all the way to Dark, which was a perfect match for me. The second great feature is the actual formula - this BB Cream is a bit thicker than some of the others I've tried. It's closer to a lightweight creamy foundation, but still very light on the skin. I loved how easily it was to apply (both fingers and foundation brush were great), and the lasting power was fantastic - it really didn't budge, smudge or come off in any way. It didn't clog my pores or dry out my drier parts of my face either, which was nice. The formula is quite concentrated, so only about a dimes worth is needed for coverage. Again, it's important to note this is not a foundation - so it works best for those of you with good-to-great skin tones without too much discoloration, etc. However, this is a product which could be used in conjunction with a foundation, it needed for additional coverage, since it's also a primer/sunscreen. The finish was very nice - Camera Ready BB Cream is slightly dewy but still provided a great amount of oil control for my t-zone (I usually only had to do a light blot once during the entire day to freshen up). *This product was provided courtesy of Smashbox PR for reviewing purposes. Hi, so I'm a complete newbie to make up. I have a good complexion so I'm wondering, do I need to get foundation and a bb or could I just use a bb? If you have a good complexion, I would recommend just the BB cream for everyday. However, if you want to look a bit more "polished" for photos, etc. then a foundation would be ideal.